Chandler Egyptian Cotton Growers Assn. Chandler High School, c 1930. 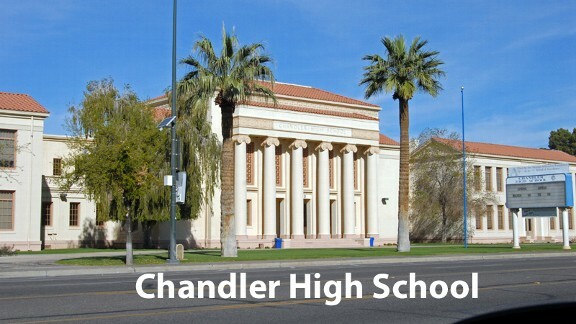 By far the oldest high school in the city, Chandler High first opened its doors in 1914. 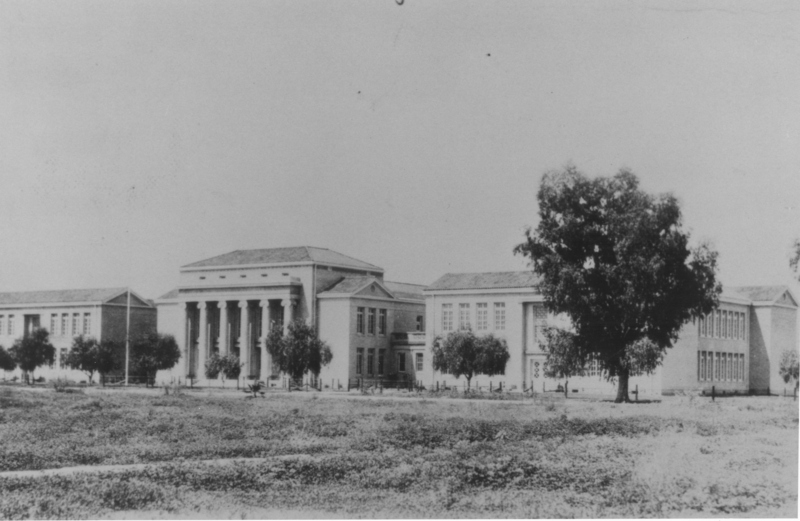 Formally dedicated in 1922 after extensive expansion, Chandler High was noteworthy because of a large auditorium and its eletronic clock/bell system (mychandlerschools.org). As the school expanded, new state of the art buildings such as the gymnasium were added to the existing schoolrooms. Despite all the expansion, the original shool buildings remained intact. In 1996, the original buildings were dubbed "Old Main" and preserved from demolition. Hamilton High opened its doors in 1998; the additions of Basha and Perry have helped stablize Chandler High's enrollment numbers. Today, Chandler High enrolls about 3,000 students. The school provides a comprehensive education for its students, and focuses on the "three A's": Academics, Athletics, and the Arts. Chandler High was recognized by the Arizona Education Foundation as an A+ school of excellence (mychandlerschools.org). In 2007, Old Main was added to the National Register of Historical Place (Images of America: Chandler; Jody A. Crago, Mari Dresner, and Nate Meyers). Having existed for a century, Chandler High has witnessed many pivotal moments of the twentieth century. One such event was the integration of schools. Since its founding, Chandler High was a whites-only school; African-Americans attended Carver High in Phoenix, more than twenty miles away. In 1949, five years before the Supreme Court ruled in favor of integration, Chandler ended its segregation policies and welcomed people of color into the student body.